I used to love going to the Salt Lake farmers market. When I lived downtown, I would get up early every Saturday morning during the summer and do all my fresh produce shopping at the farmers market. Since moving to Utah County, I try to make it downtown, at least once a month. Unfortunately this year, I was a little disappointed. The wonderful market that used to great me with the heavenly aroma's of fresh herbs, flowers, fruits, and baked bread, now punched me in the face with the smell of body-odor, wet-dog, cigarette smoke, and funky herbs... What happened??? Ironically it took me back to my childhood and reminded me of the markets in Germany. I still found some great produce and fresh herbs and while the smell was somewhat nostalgic for me, my husband could only take it for so long. We bailed early. Anyway, below is a great "farmers market" recipe. It's a great twist on pesto. The tomatillo's add a tangy zest that lightens the whole dish. 1. Preheat oven to 400 degrees. Quarter tomatillos. Place tomatillos and garlic in a bowl; add oil and toss to coat ingredients. 2. Spread tomatillos and garlic cloves in a baking dish; roast for 35 minutes. 3. Place roasted tomatillos mixture in a food processor; adds spinach, basil, broth, oregano, thyme, sugar, salt, pepper, and cheese. Process until sauce in blended. 4. Cook pasta choice, according to package instructions. Drain and set aside. 5. 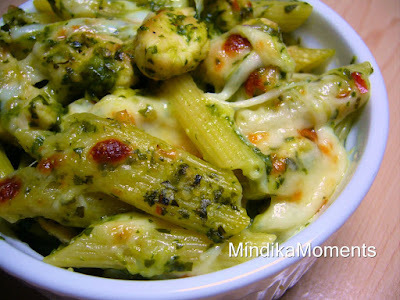 Mix pasta, tomatillo sauce, chicken and Parmesan cheese and put into a 9x13 baking dish. 6. Top with mozzarella cheese and bake at 350 degrees for 30 minutes. This recipe looks so fresh and tasty! I may have to go to the farmer's market Saturday! Thanks for a a great idea to use basil! You will have to tell me which farmer's market you go to...I'm in the Draper area. Mind, I love reading your blog. I totally hear you about dreaming of the return of the "pre-pregnancy" me. I am with you sister. I think you are amazing to do all you do - working and doing all this great cooking. You rock in my book, girl!